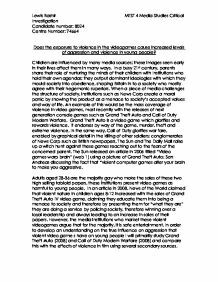 Does the exposure to violence in the videogames cause increased levels of aggression and violence in young people? Children are influenced by many media sources; these images seen early in their lives affect them in many ways. In a busy 21st century, parents share their role of nurturing the minds of their children with Institutions who hold their own agendas; they output dominant ideologies with which they mould society into obedience, shaping Britain in to a society who mostly agree with their hegemonic superiors. When a piece of media challenges the structure of society, institutions such as News Corp create a moral panic by showing the product as a menace to society's accepted values and way of life. An example of this would be the mass coverage of violence in video games, most recently with the releases of next generation console games such as Grand Theft Auto and Call of Duty Modern Warfare. Grand Theft Auto is a video game which glorifies and rewards violence. It endorses by way of the game, murder, theft and extreme violence, In the same way, Call of Duty glorifies war fare, enabled by graphical detail in the killing of other soldiers; conglomerates of News Corp such as British newspapers, The Sun and The Daily Mail raise up a witch hunt against these games reaching out to the fears of the concerned parent. The Sun released an article in 2006 titled "Video games warp brain" (web 1) ...read more. The non diegetic sound can change the mood of the visuals; in Call of Duty 4 there is a scene in which the protagonist (whose eyes you are viewing the events through) is tortured by terrorists burning lighted cigarettes on your lifeless body as they beat you up to near unconsciousness the sound can suggest pain and agony because. Even when you play as the character killing other men, the non diegetic sound makes you as the player feel sympathy for the death of another man; however when looking at Grand Theft Auto IV, the game uses non diegetic sound to connote justification and triumph. The way some may interpret this is that violence is acceptable. Certainly the Camera angles such as a low camera shot in GTA IV which gives a view of the character as powerful and dominant with his weapon gives the audience a glamorization of violence. Sympathy can be generated for a character if the camera takes the POV of the character. Again using the example of Call of Duty 4, the question can be asked, which end of the barrel of the gun are the audience looking down? The audience identifies with the perpetrator of the violence. Realism in a game changes the emotion we feel and how we identify with the characters, in the example of "Call of Duty 4", we see total and graphic realism of a war, however it is edited and uses sound effects. ...read more. In over the top fashion characters are mutilated often with fatal consequences, however the character makes a full recovery in the next scene. We can compare this harmless "slapstick" comedy of the past with an ultra realistic and graphic depiction of death that young people are exposed to in Grand Theft Auto and other similar games. Children have always been exposed to violence, yet the interactivity of the violence today makes them feel part of the violence and thus making them more involved. Videogames give young people a form of escapism into a life that is different than the one they live. The reality that they construct allows them to perform things deemed unacceptable or simply unachievable in everyday life. However, this causes desensitization to right and wrong, giving them a warped view of morality. Violent videogames influence violent behavior in easily led and easily manipulated young minds. 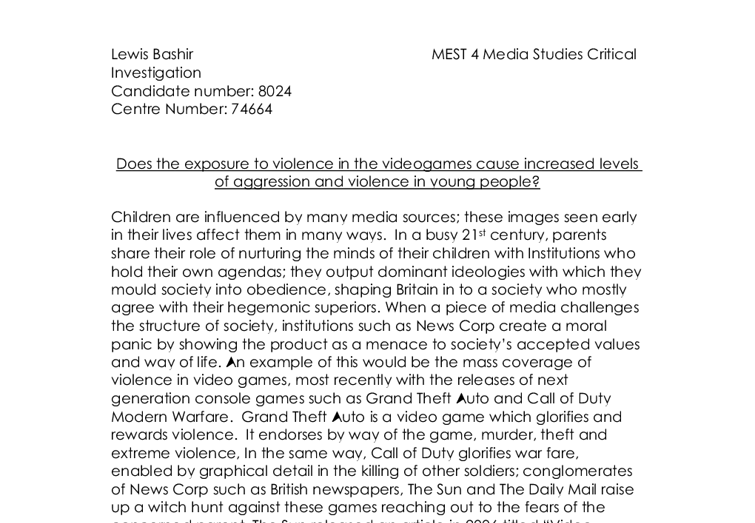 Although games that promote violence and crime are censored by the British classification board (BBFC) and PEGI, these censors can be easily evaded and young people can gain access to harmful pieces of media. Violence video games like Grand Theft Auto and Call of Duty promote and in some cases glorify violent actions, until further regulation is put into practice on these games; young people will play these games without the moral thought not to put into practice the violent deeds played out in the videogame. ...read more. According to Morris and Wynn (1990) it is widely accepted that Homelessness is a serious social problem. However, there are also disputes surrounding the problem, such as the causes and the policies. They argue that it is how homelessness is perceived and the way in which assumptions about the causes of homelessness underlie this perception that influences housing policies. This causes an individuals choice of identity to be overpowered by outside influences such as celebrities- "The star is seen as an object of desire and is studied in terms of the ways in which spectators identify with, find meaning in, and gain a certain fulfillment from her image. "(Watson, 2003:171). Advertisements can be a good way of promoting new products and businesses just down to the sheer amount of people who actually use the internet. Some advertisements on the other hand can be very annoying leading to people ignoring them and closes that window. by consumers for a fixed market basket of goods and services, was 2.4 percent. Although both price index had increased from the previous year but it had remained low when compared with over the past 20 years. Unemployment Rate: The U.S.
4.3 Competitors Manufacturers * Sony is in front thanks to excellent sales of its new portable console. Meanwhile, the Playstation 2, already considered old hat in the video games world, is still making very strong profits. Other children who watch their friends play these types of games become curious and want to try the game out for themselves. This is also similar to peer pressure. Anyone who plays these types of video games will no doubt try to influence all their friends to play the same game too. They believe that mass media dulls the mind and we are living in a fictional world, this can be reinforced by the fact that most newspapers cover stories that take place in soap operas, and most day-to-day talk involves what happened in a recent soap opera episode. The conclusion chapter of the dissertation will examine the final product and whether the product has been completed and met, and the section will also include how the product could have been improved. 2. LITERATURE REVIEW 2.1 Introduction The literature review of the dissertation will analyse the essential parts required to the development of a more secured eCommerce website.